Old Dog Brown brings back his favorite technothriller heroes for what will likely be their 15th consecutive assault on the bestseller list, despite ever more unwieldy plots, laboriously detailed fantastic weapons, and bombastic action sequences. Forcibly retired US Air Force General Patrick McLanahan (Wings of Fire, 2002, etc.) and his unsanctioned Night Stalker special ops corps of freelance commandos (who work outside the government) have saved the world several times over from total destruction and always win the biggest stakes on the table. What is an Air Battle Force? Well, former child prodigy aeronautical and space engineer Jon Masters has devised the Vampire bomber, which carries StealthHawk Unmanned Combat Air Vehicles within it. McLanahan leads the 1st Vampire Squadron, and StealthHawks are the leading edge of the force he and Wing Commander Rebecca Furness use to launch a counterattack against Afghan Captain Wakil Mohammad Zarazi’s Taliban troops, who capture a UN Afghan Relief and Rehabilitation unit in Northern Afghanistan. Air Battle Force is the future of air warfare and in part consists of robot warplanes launched from the Vampire bomber. Flying a B-1 over air space congruent to Afghanistan, Iran, Pakistan, and Turkmenistan, McLanahan loses a robot plane and goes searching for it through various hostile radars and air defense systems while running almost on empty. As it happens, the Turkmenistan oil fields have become the prime target of Taliban and Al-Qaeda forces no longer safe in Afghanistan. The novel bomber makes a pancake landing, skipping off the ocean onto a beach. The technoclimax comes with the Vampire in a dogfight while attacking an airbase in the Russian Federation. 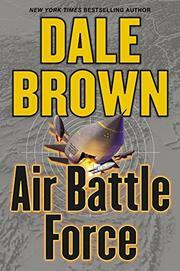 Tense pages hard-focused on aerial hardware as Brown pumps it up for fans—who know what they’re getting.